A British jihadist who fled to Syria in 2013 is responsible for the CyberCaliphate hacking group which attacked the Pentagon’s US Central Command Twitter account on Monday, senior security experts and government officials say. US and European officials said they strongly believed that Junaid Hussain was the leader of CyberCaliphate, though they could not confirm that he had any personal involvement in Monday’s attack, which saw the US Twitter account post a threatening warning to US soldiers. 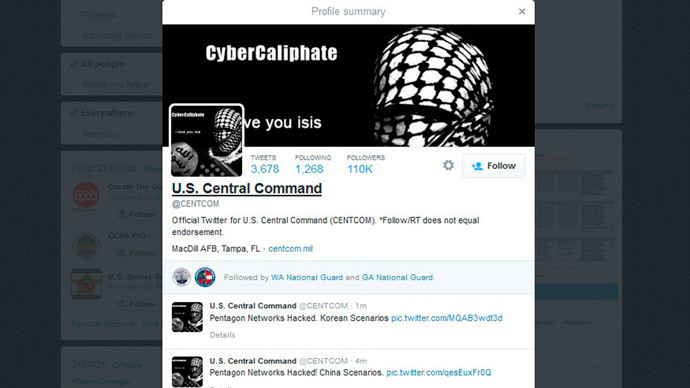 During the cyber-attack on the Pentagon, the Twitter and YouTube accounts of US Central Command, which oversees military operations on the Middle East, were filled with pro-ISIS messages and threats to US soldiers. Hussain was jailed in 2012 for six months after hacking the personal address book of former Prime Minister Tony Blair. The hacker accessed the personal documents via an email account maintained by one of Blair’s advisers. He pleaded guilty to publicly posting the details of the address book online, and making fake calls to a counter-terror hotline. After his release, Hussain left the UK and traveled to Syria in 2013. Senior military investigators said they were trying to locate the source of Monday’s attack to see whether it had been launched from Syria. They further said they had yet to finish examining the evidence. Following the Pentagon attack, spokesperson Colonel Steve Warren said the information leaks were “inconvenient,” but not a major threat. As well as posting pro-ISIS messages, the hackers also leaked maps of strategic US military bases. Warren, however, said that none of the information leaked was sensitive or classified, and the New York Times reported that most of the information was freely available on the internet. The investigators further believe that Hussain was responsible for maintaining the Twitter account which operated under the name Abu Hussain al Britani. This account, which has since been suspended, is suspected to be one of the main accounts behind the attack. One government source said it was possible there was more than one individual using the account. Alex Kassirer, an analyst for Flashpoint Global Partners, told Reuters that the British jihadist coordinated the recruitment of hackers for CyberCaliphate. Reports of the drive for new ISIS tech members first appeared in September 2014, when a “recruitment announcement” was posted.